It was about a month back that I was first approached by Shethepeople.tv to be a part of their ‘Women in Leadership’ and #EveryWomanIsALeader Campaign. I hesitated to jump in, simply because inspirational writing isn’t really my forte. But then, my thoughts turned to some amazing women I have known, and have met, through the years. Here was an opportunity to write about them. Besides, I rationalized, maybe the post would help explain to some of you, why I do what I do, and who inspires me to! So, here I go, trying something new, and hoping you will like it…. A leader is "a person who influences a group of people towards the achievement of a goal"
That is possibly the simplest and all-encompassing definition of the word. The goal could vary, but the quality to lead doesn’t. We think of leaders as those who rule, or those who hold high positions, or those who run organizations. 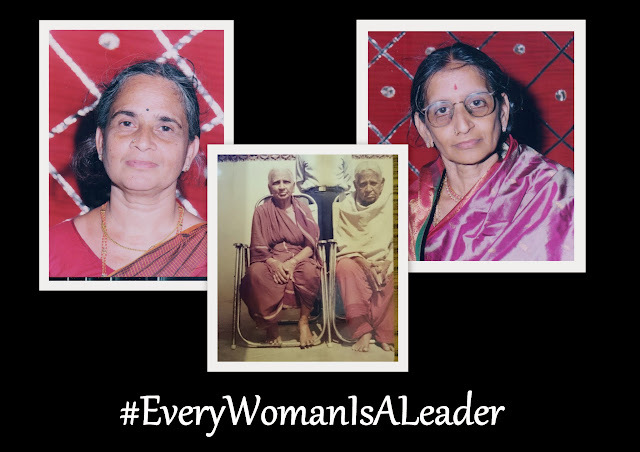 But the woman who runs a home is no less a leader than any of them. She, in fact, has more responsibilities on her shoulders than any professional. And it is these women I look up to, the most, beginning with the women in my family. My mother, of course, tops the list. Her innate sense of leadership has drawn people to her over the years, and in spite of all the problems she has faced, and the disadvantages she has experienced, she manages to hold her own. The same goes for a great aunt, a young widow, who lived for her family, but who, in every sense, held the reins of the house tightly in her hand, almost till the very end. She passed away recently at the age of 100, and my last memory of her is a conversation about a month before her death, where she could barely see or hear, but her intellect remained just as sharp. It was evident that though the circumstances had changed, she still held the reins of the family! And then, there was another great aunt (I come from a huge family and have loads of great uncles and aunts and am close to each one of them!). After losing her husband and child, she chose to study and become a teacher, that too way back in the 1930s, when widows weren’t encouraged to leave the house. She passed away many years back, but I remember her as a strong and independent woman, who led the family so well, she was an inspiration to many! Moving on to the family I married into, today, when people talk of solo women travel, I can’t help but think of my husband’s mother, as well as grandmother, both of whom travelled alone all the time. They did not have the convenience we take for granted these days. A journey to their village from Mumbai involved changing trains multiple times, and sometimes, without even a reservation! And yet, they managed the trip year after year, sometimes with their children in tow, and almost always massive luggages that involved vessels, clothes, gifts and god knows what else!!! They arranged marriages and orchestrated all sorts of functions, managing the kitchen and the social life with equanimity, first learning the ropes, then leading the way! Then, there are the women I have met on my journeys – the guide at the City Palace Jaipur, who was the first female guide there, who had risen to the challenge after losing her husband to a tragic accident, and who proudly told me how she had fought for her place and won! A pair of women I met at Sirpur in Chhattisgarh told me how they travelled together to all sorts of places, and then helped others make the journey. Women I met in the hills were a lot more articulate than the men. They lived under the toughest of conditions, and yet ran the house with the meager earnings the men brought in. They led, not just their families, but the entire village. I attended festivals which were organized and run so well, by these same women, which would put event managers to shame! What makes these women leaders? They have all battled issues and circumstances, and yet, these problems have only brought out their leadership qualities. For most of them, the driving force is their family, and their burning desire that their family should do well. They are willing to sacrifice anything and everything for their family. The sacrifice however, hasn’t made martyrs of them. It has only made them stronger, and more adept as leaders. They are the ones who pave the way for the success of their family, and yet, almost none of them take credit for this success. Does it lessen their leadership? I believe not, for the best leader is the one who helps every single member of the team reach their true potential. And that is just what these women do! It is these women I seek to emulate, and as I sit and write this post, recuperating from one trip, preparing for another, and planning for more, while the kitchen beckons and the house cries out for attention, I thank these women for being a part of my life. I have been compensated for this post by SheThePeopleTV, but you can win an all-expense-paid trip to an exciting destination, by participating in their contest. All you have to do is pen down your thoughts on “Women in Leadership’, and submit it on the site. To know more details, head out to their site and check the rules and regulations! Thank you so much, Nisha!! Great article Anu! It's hard to step out of your comfort zone, but you did a great job! It was great to read of the women who influenced you to be who you are today. Wonderful post, Anu. This is such a nice way to acknowledge and salute the women we take so much for granted in our lives. This is especially true of women who travelled solo, before it became the vogue that it is today.